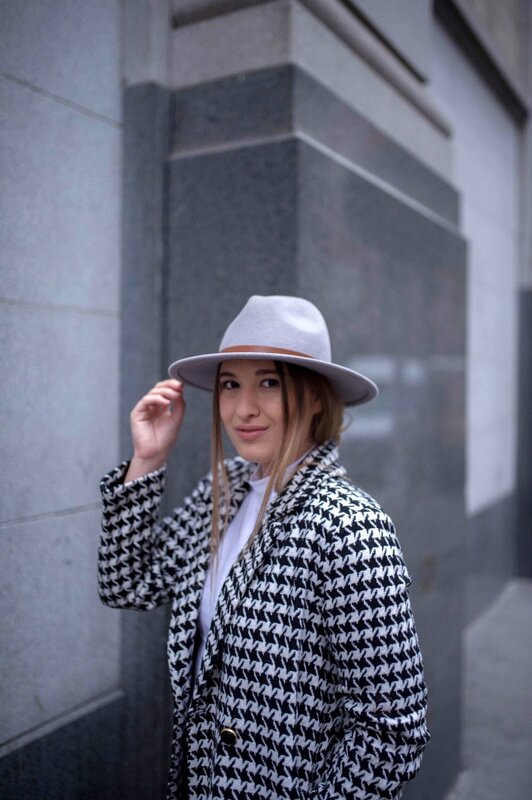 NYC-based fashion and lifestyle blogger, Lauren Mazzei needs no introduction. With a growing community of over 105K followers, Lauren leads and inspires the fashion and beauty spaces, working with big-name brands and curating content that speaks to the latest trends and styles. She gives real-world fashion tips for people in their twenties and thirties and provides a grounded perspective for those looking to learn more about the fashion industry. She holds authenticity close to her heart; if she doesn’t believe or support a brand, you definitely will not see it represented on her channels. I found Lauren a couple years ago, and instantly thought of her like a friend I could go to for advice, who would give it to me straight! Read on to learn more about how one of the strongest personal brands in the industry right now came to be, plus how she curates content that accurately represents her, and gains inspiration by welcoming change. Lauren, WTF is a personal brand? A personal brand is how you define yourself, whether you are a company, brand, product or an individual. It is the foundation of how you see yourself and how you want to come across to others. How would you describe your personal brand in three words? Realistic. I would never want to portray something that is not naturally who I am or what I support. I strive to never portray a life that is “too perfect.” My followers see my stories day-to-day and can tell that I work full-time and create content on the side. I work hard, but am not going to beat myself up if my content isn’t “perfect”. Inspirational, empowering and encouraging my audience to be their best selves, and to create their own personal brand. What inspired the growth of your personal brand? After graduating college, I felt like I didn’t have a creative outlet. While I was making my move into the working world, I wanted to ensure that I had some sort of creative hobby. Blogging became a great way to network and eventually led to me get my current job in Digital Marketing. I love having the balance of my professional interests and my creative hobbies fully integrated into my day-to-day. I began shooting and developing my personal style as I became more acclimated to my surroundings in New York City. Initially, I began to develop a personal brand that didn’t feel true to myself. I was trying to fit into a specific niche, and it became hard to create content - because it just wasn’t me. So, I underwent a personal rebrand. I changed my blog name to be just my name because I wanted it to be my personal brand, and I wanted to accurately portray that. I adapted my own personal style to be something that fit with and paralleled my surroundings at the time. I worked to find a brand aesthetic that best portrayed my current situation, showcasing exactly who I was, what my interests were, and what I was doing. My personal brand journey began evolving then, and even today, it still evolves. It will always be evolving, and I’m okay with that! What are your tips for growing a social media or personal brand presence? You definitely need to start off by understanding what your personal brand is. Whether it’s on social media, a blogging platform, or YouTube, find a way to describe what is on your mind through words and description. Understand the look and feel that you would like to display and stick to it. That way, you will have a foundational element to build from. Then, plan and create content around your personal brand. Give value, and keep giving value, by creating content that you are proud of & resonates with your personal brand. Another key tip is to engage and network with others in the industry daily—whether that be with other bloggers, brands, etc. Make the effort to seek out and attend events, grab coffee with people local to your city, and truly dedicate time to building a network. I’d also suggest being as candid as possible when reviewing products and places, but still maintaining a level of professionalism and respect. When reviewing products, I will state if I do not like something, but will say so in a respectful, detailed way, and potentially suggest another product of the same brand that I do like. This honesty will lead to your opinions not being discredited. Finally, do not be afraid to reach out to brands you want to work with. You can usually find their contact info online, or just be bold and DM them—what do you have to lose? When you write to them, start with a compelling intro as to why you would be a valuable business partner, and then offer a personalized proposal explaining why working with your personal brand would benefit their brand and vice versa. You’ve spoken about evolving your personal brand. What are some ways to do it? I believe you have the power to change the course of your personal brand whenever and however you choose, because it’s a direct representation of your interests. And, as people change, their interests change, too. When you’re creating content, even the smallest detail like changing the color scheme of a photo can make a big enough difference to evolve your personal brand. For example, if I want to be edgier, I’ll edit my images a little darker. If you look at my Instagram feed over the years, you’ll see that I’ve made changes to it—changing my personal brand. Some content creators are very colorful, and that's their personal brand. Others are moody, and that’s theirs. It’s all a matter of choosing what works for you, and evolving when you decide you want to explore a different space. If I don’t like the content that I’m creating, I’ll change it up—I’ll focus more on Beauty vs. Fashion, or Lifestyle & Home Decor. That’s how you can change your personal brand. It also helps to identify a few key inspirational people in your field or similar industries that you can look to for guidance. I love my job in digital marketing and foresee my next moves as a content creator to be stemmed from trends in the technology industry. Where my blog will take me will be dependant on how technology will adapt and how social media will change. Finally, what does “Simply Be” mean to you? Simply be yourself—that's your personal brand. Being true to your words. As long as you work hard and are be yourself, you can succeed in anything you choose to do!